An esophageal stricture is a gradual narrowing of the esophagus due to the build-up of scar tissue. There are many causes of esophageal inflammation and scarring, which can lead to serious swallowing difficulties. Turmeric is a common Indian and Asian spice that displays some medicinal properties, such as the ability to reduce inflammation and combat antioxidants. Turmeric is not considered a treatment or cure for esophageal strictures, although it may help prevent them in some capacity. However, more research is needed before any recommendations can be made. Consult a naturopath or practitioner of ayurvedic medicine about the potential benefits and side effects of consuming turmeric. The esophagus is the tube that runs from your throat to your stomach, delivering food and liquid into your gastrointestinal system for digestion and absorption. The lining of the esophagus can become damaged from a variety of conditions such as acid reflux disease, chronic vomiting, alcoholism, infections, medical procedures or cancerous processes. Esophageal damage leads to inflammation, which eventually causes scar tissue build-up. Consequently, the lumen of the esophagus becomes narrow and stiff. The repeated inflammation and scarring will eventually produce damaged tissue in the form of a ring that severely narrows the opening of the esophagus, which is called an esophageal stricture. The primary symptom of an esophageal stricture is difficulty and discomfort with swallowing food and even liquids due to the inflammation and narrowing of the esophageal lumen, according to the “Textbook of Functional Medicine.” Other common symptoms include the sensation of having food trapped in the esophagus, regurgitation of food, weight loss and malnourishment. Diagnosis of an esophageal stricture is done by either a barium swallow and X-ray or an endoscopy exam. Standard medical treatment usually involves drugs called proton pump inhibitors, as well as anti-inflammatories and vasodilators. Surgical treatment is considered in extreme cases. There are no herbal remedies specifically recommended for esophageal strictures, although turmeric’s various properties may be useful. Turmeric root has been used for centuries in India as a dye, spice and herbal remedy. The root is dried and ground into a yellow-orange powder and is a common ingredient in curry and other Asian dishes. The main medicinal compound in turmeric is curcumin, which is a powerful antioxidant, antibacterial and anti-inflammatory, according to the “Natural Standard Herb & Supplement Reference: Evidence-based Clinical Reviews.” Turmeric powder and curcumin extract are used to treat heartburn, stomach upset and a variety of gastrointestinal complaints. Acid reflux disease, or chronic heartburn, is a significant cause of esophageal strictures, so turmeric might help reduce the risk. Furthermore, turmeric is a good anti-inflammatory that reduces antioxidants, deters infection and promotes healing, which are potentially beneficial for esophageal strictures. Ask your doctor if turmeric is contraindicated if you have chronic inflammation of the esophagus. Curry dishes are rich in turmeric, although you can also take the herb in capsule form. 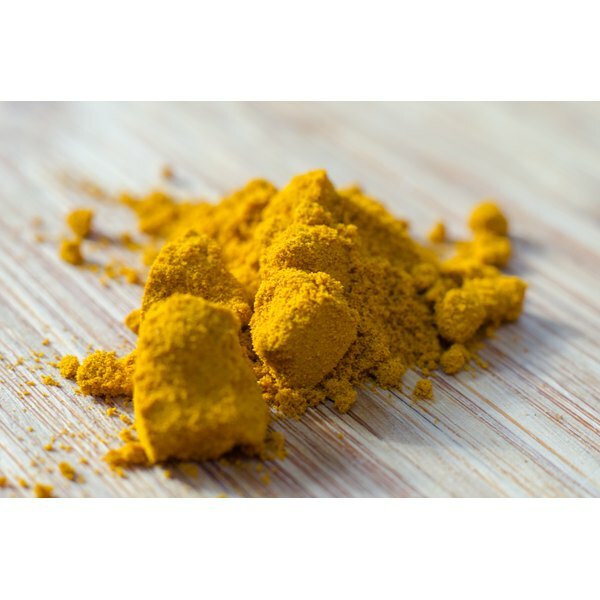 Consumed as a health supplement, recommended dosages of turmeric powder are usually between 250 to 500 milligrams daily. The toxicity of turmeric has not been established because it causes so few side effects in large dosages. Ask a herbalist about appropriate daily dosages. General and Systematic Pathology; Paul Bass et al.